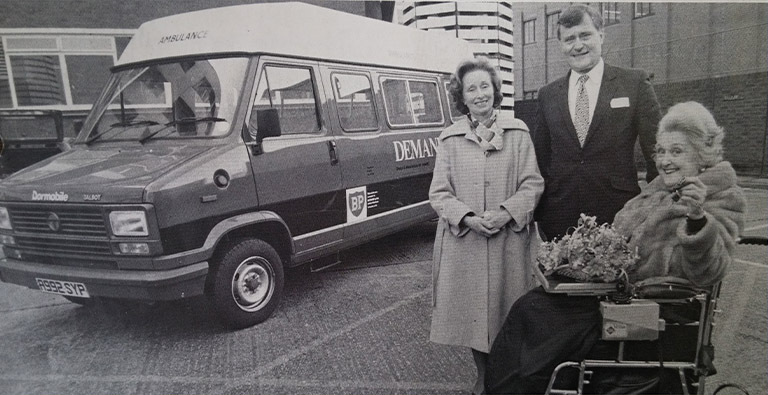 DEMAND’s founder Lady Claire Renton was only too aware of the problems and challenges associated with caring for someone with a disability. Her youngest daughter, Davina, was born with Rett Syndrome, a rare and severely debilitating chromosomal abnormality affecting only girls. At a time when disability equipment was hard to come by, Lady Claire Renton (Paddy to her friends) struggled to find seating appropriate for her daughter’s complex needs. She learnt that the London College of Furniture was making seating and postural support for people with disabilities. At the invitation of Brian Boothby, Principal Lecturer in Design, she visited the College to receive a chair that had been custom-made for Davina, and asked if there was anything she could do to help the programme. The College told Lady Renton of their plans to extend the work and establish a unique postgraduate course to train designers in the unique considerations of designing disability aids. Paddy jumped at the opportunity of being a part of this innovative initiative and DEMAND was registered as a charity at the end of 1980. It had the twin objectives of promoting the design and manufacture of equipment for people with disabilities, and funding bursaries to support students taking the Postgraduate Diploma in Design for Disability. Dr. Max Caplin, one of DEMAND’s early Trustees, summed up Paddy’s contribution in his tribute after her death in 1986. Today we are fortunate to have strong links with our founder in the form of Davina’s sister, The Honourable Clare Renton, a renowned Family Law barrister, and her cousin, Lady Hermione Grimston as Trustees of the charity today. Find out about DEMAND’s current trustees. Owing to DEMAND’s roots in education, we strive to find new opportunities for young designers and engineers to learn about disability through our education initiatives.